Fran Kirby, the Chelsea Ladies and England striker, is the first winner of the Footballer Writers’ Association’s Women’s Footballer of the Year award. 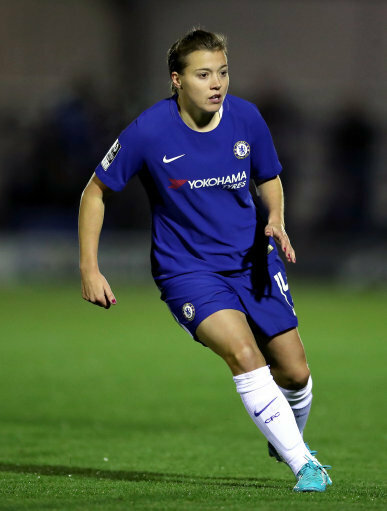 Kirby, 24, has scored 22 goals this season for Chelsea who lead the FA Women’s Super League, have reached the final of the Women’s FA Cup and the semi-finals of the Uefa Women’s Champions League. She also starred for England as they reached the semi-finals of Euro 2017. Kirby was the overwhelming choice of the 22-strong panel of expert members of the FWA. Having led the preliminary vote from which a shortlist was drawn up she scooped more than 50 per cent of the final tally. Jodie Taylor, who won the Golden Boot at Euro 2017, and is now at Seattle Reign having also played for Arsenal and Melbourne Victory during the last 12 months, came second. Lucy Bronze (Lyon), Izzy Christiansen (Manchester City) and Jordan Nobbs (Arsenal) made up the rest of the short-list. Patrick Barclay, FWA Chairman, said: "Congratulations to Fran Kirby on being such a worthy winner of this historic vote by an expert panel of FWA members. “I can't help thinking of our first Footballer Of The Year vote back in 1947, when the winner was one of England's most admired players of all time, Sir Stanley Matthews. Now, after Stan, comes Fran - she'll always be first in what will become a long list of Women's Footballers Of The Year. “It was a great achievement to emerge from such a strong short list and let's hope Fran can take inspiration as Chelsea prepare for a tough second leg in Germany." Kirby will be presented with her award, alongside the Footballer of the Year, at the FWA's annual awards dinner on May 10 at the Landmark Hotel in London.